You may know Steve Harvey as one of The Original Kings of Comedy or as the host of popular talk and game shows like Family Feud. But before he became one of television’s preeminent emcees, the actor and comedian headlined his own long-running situation comedy: The Steve Harvey Show. When Steve Hightower (Harvey) reaches the end of the road as an R&B singer, his best buddy Cedric (Cedric the Entertainer) gets him a job as a music teacher in a Chicago high school. One problem: Steve’s new boss Regina Grier (Wendy Raquel Robinson) is a former classmate he used to tease about her weight. Now the principal formerly known as “Piggy” plans to exact her revenge on her former tormenter! Over time, Steve transforms from a bitter former celebrity into a trusted mentor and father figure for his students, including ladies’ man Romeo Santana (Merlin Santana), Stanley “Bullethead” Kuznocki (William Lee Scott), dorky Lydia (Lori Beth Denberg), and tough cookie Coretta “The Ox” Cox (Robin Yvette Allen aka The Lady of Rage). In season one, Tracy Vilar and Netfa Perry play bickering rivals Sophia and Sara and Terri J. Vaughn joins the cast in season two as Lovita Alizay Jenkins, Cedric’s girlfriend (and later, wife). This hit series was the flagship of The WB network for six years and was a frequent NAACP Image Award-winner. And more than two decades after its debut, it’s still fondly remembered by fans. You can see why when The Steve Harvey Show joins the getTV lineup October 1! Two episodes air weeknights at 11p ET with two more at 8a ET during our morning sitcom block! And for those who want to take weekend classes at Booker T. Washington High School, we’ve got two episodes Saturday afternoons at 1p ET. Here are some fun facts about The Steve Harvey Show. 1. Cedric The Entertainer and Steve Harvey have a long history. Harvey got his start in stand-up when he won an amateur comedy competition in the mid-1980s. In 1993, he opened his own club — Steve Harvey’s Comedy House — in Dallas, Texas. One night when his headliner was bombing, Harvey gave a spot to an up-and-coming comic named Cedric The Entertainer (real name Cedric Kyles). The two became fast friends and developed an on-stage rapport that would carry them to TV in 1996 with The Steve Harvey Show, to the arena stage with The Original Kings of Comedy in 1998, and to movie theaters with Spike Lee’s concert film of their wildly successful tour in 2000. They continue to work together today, a quarter century after their first meeting. 2. It wasn’t Harvey's first sitcom. After a decade as a comedian and one season as host of the syndicated Showtime At The Apollo, Harvey got his own ABC sitcom in 1994. In Me And The Boys, Steve played a widowed single dad who ran a video store in Dallas. Emmy® winner Madge Sinclair played his mother-in-law, who helped him raise his three sons after his wife’s death. The series was a top 20 hit following Full House, but the network chose not to bring it back for a second season. 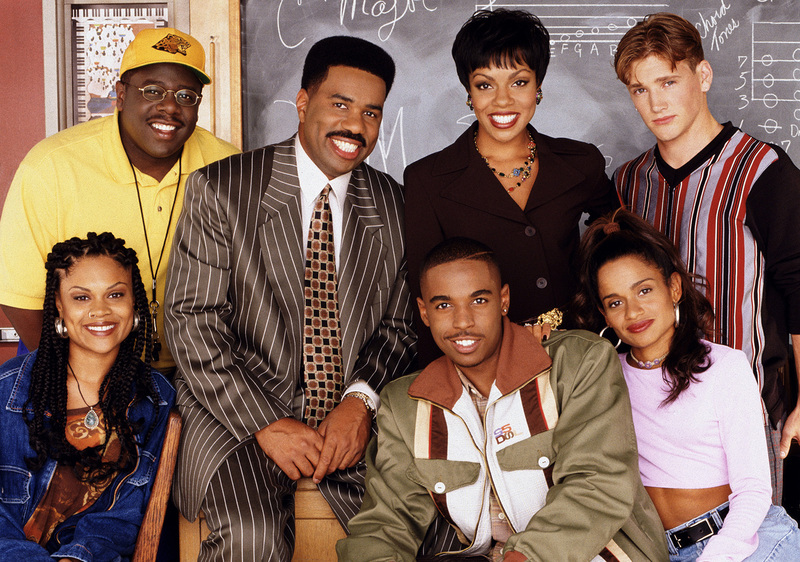 Seventeen cast and crew members from Me And The Boys went on to work on The Steve Harvey Show, including Wendy Raquel Robinson. 3. The Steve Harvey Show demonstrates his life-long love for music. Steve’s mother was a Sunday school teacher in Cleveland, Ohio and Steve sang in the church choir until college. He plays a singer on The Steve Harvey Show, but Steve can also be seen playing instruments like the saxophone and piano. He also sings frequently on the series with his fictional former funk band Steve Hightower And The High Tops: Ronald Isley (of the Isley Brothers), T.K. Carter, Don “D.C.” Curry, and Jonathan Slocumb. 4. Music superstars make guest appearances on The Steve Harvey Show. Steve Hightower’s background in a 1970s funk band gave producers a good excuse to cast current and former music stars in guest roles. Hip hop, R&B, and jazz stars who appear on The Steve Harvey Show include Snoop Dogg, Sean “Diddy” Combs, Busta Rhymes, Teena Marie, Brian McKnight, Meagan Good, Bow Wow, Jermaine Dupiri, and Teddy Riley. 5. A TV Icon plays his mom. In the season one episode That’s My Mama, Steve’s mother is played by All In The Family and The Jeffersons star Isabel Sanford. The title of the show is an homage to the African-American sitcom of the same name that aired on ABC during the 1974 and ’75 seasons, featuring Clifton Davis (Sherman Hemsley’s co-star on Amen) and Good Times supporting players Helen Martin (Weeping Wanda) and Theodore “Teddy” Wilson (Sweet Daddy Williams). 6. A Saturday Night Live cast member has a recurring role. 7. The series pays homage to African-American TV stars of the 1970s. African-American TV icons are featured frequently on The Steve Harvey Show, including Ernest Lee Thomas (What’s Happening), Kim Fields (The Facts Of Life), Antonio Fargas (Starsky And Hutch), Phil Morris (Mission: Impossible), Vernee Watson (Welcome Back, Kotter), and Good Times star Ja’Net DuBois. 8. The Steve Harvey Show was created by a Golden Girls writer. 9. It was directed by a Sanford And Son director. Stan Lathan was executive producer on The Steve Harvey Show and directed all 122 episodes of the series. His first sitcom credit was the 1974 episode of Sanford And Son in which Lamont takes Fred to the hospital to check out his “heart attacks.” He went on to direct six episodes of Sanford And Son, plus That’s My Mama, Barney Miller, Eight Is Enough, Amen, and The Redd Foxx Show among many others. In 2012, Lathan reunited with Cedric The Entertainer to direct 41 episodes of his sitcom The Soul Man. His daughter is actress Sanaa Lathan. 10. There was a Steve Harvey reunion. Sort of. In 2012, Steve and Cedric The Entertainer reunited to sing the Steve Hightower And The High Tops hit “When The Funk Hits The Fan” on Harvey’s daytime talk show. The audience loved every minute of it. And get ready, because the funk is about to hit the fan once again on getTV! Two episodes of The Steve Harvey Show airs weeknights at 11p ET with another two episodes weekday mornings at 8a ET. For more, visit the getTV schedule.